Last fall, we were guests at a wedding in Amish country, and one of the most amazing culinary aspects of that celebration was the pretzel truck. During the cocktail hour, soft pretzels were served — hot and fresh — right off the truck. We’ve been thinking about those pretzels ever since. 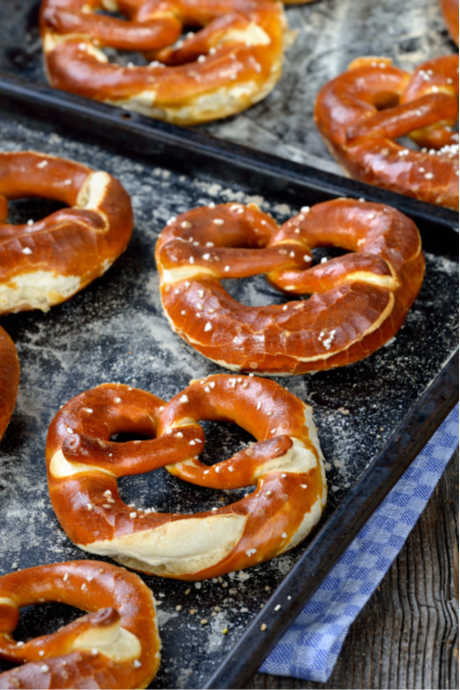 If you’re thinking about hot soft pretzels now too, we’ve got good news: We searched for authentic pretzel recipes, and we found three mouthwatering options. Choose the one that’s right for your timetable and comfort level. First, let’s explore why pretzels have such an unmistakable color and flavor. In this cooking lesson on The Kitchn, they note the similarities between sandwich bread recipes and soft pretzel recipes. Specifically, the ratio of liquid to flour is fairly consistent whether you’re making pretzels or bread, and they all contain yeast, of course. But it’s the alkaline bath that turns this ordinary dough into pretzels. Whether you shape it into twists, roll it into sticks, or gather it into rolls, your creations need a quick dip before baking. This piece from NPR explains how the alkaline solution changes proteins in the dough, which in turn affects the Maillard reaction that occurs as your pretzels bake. The altered proteins react differently with sugar than they otherwise would, which gives pretzels the color and flavor that sets them apart. It’s the nature of this alkaline bath that’s the substantive difference between these three pretzel options. Regardless of which one you choose, exercise appropriate caution when working with your alkaline solution, which can react with aluminum. If you’d like to start slow and enjoy your hot soft pretzels on the same day you make your dough, we recommend this recipe from Alton Brown. Even if you choose the intermediate or expert options below, we still encourage you to watch Alton’s video to get a few smart tips. The second reason why this recipe is the basic one is the alkaline bath: It’s a mixture of plain baking soda and water, simmering in a deep saute pan. He does use a hefty amount of baking soda, compared to other recipes we found, which will help accelerate that Maillard reaction. Finally, we like how he uses a splatter screen to transfer the pretzels from the alkaline bath to the baking sheet. If you’ve ever thought of a splatter screen as a single-use tool, this might convince you to buy one. It would come in handy for making homemade bagels too. Take your pretzels up a notch by using baked baking soda in your alkaline bath. Epicurious walks you through the process, which isn’t any more complicated than dumping baking soda on a cookie sheet and baking it at 250F for an hour. You can also follow the guidance on Serious Eats which calls for a higher temperature and longer baking period. The goal is to reduce the weight of the baking soda by one-third, which is a good indicator that it has transformed from sodium bicarbonate to sodium carbonate. This transformation is the reason for baking the baking soda: It becomes a more alkaline salt, which makes it even better for your homemade soft pretzels. It’s also more caustic than unbaked baking soda (though not as caustic as lye — more on that in the final section). Don’t handle it with bare hands. Let it cool and then use it for pretzels or store it. The soft pretzel recipe from Epicurious calls for a lower ratio of baking soda to water than Alton Brown’s recipe. However, the greater alkalinity of the baked baking soda more than makes up for the reduced amount used in the bath. This recipe also calls for proofing the dough in the refrigerator for at least eight hours, though they recommend allowing it to sit overnight if you can wait that long. As the dough slowly rises in the refrigerator, the yeast generates alcohol and carbon dioxide. The longer you let the yeast enjoy the sugars in the flour, the greater the flavor of your pretzels. But if you just can’t wait any longer, let it rise in an oiled bowl on the counter. Then go ahead and start rolling your pretzel ropes after the dough has doubled in size. Are you ready for the big time? If you want to achieve true Bavarian-style pretzels with the characteristic dark brown exterior, you’ll need food-grade lye. Working with lye can be hazardous -- even food-grade lye demands great caution -- so it’s important to protect yourself with goggles, gloves, and long sleeves. It’s also key to remember that you must always add lye to water, not water to lye. This recipe from Food and Wine includes all the details for preparing a lye bath, along with a link to purchase food-grade lye. Like the recipe from Epicurious, it calls for proofing the dough for up to 24 hours. But in this case, the instructions direct you to roll out the dough and shape it into pretzels before letting it rise for the first time. This approach requires more space in your refrigerator for baking sheets filled with pretzels, as opposed to a single oiled bowl with a ball of dough. But if you’ve already gone to the trouble of working with food-grade lye, clearing the refrigerator is the easy part. Whether you bathe your pretzels in baking soda, baked baking soda, or food-grade lye, remember to get creative with your toppings and dips. Sprinkle them with cinnamon and sugar, or a variety of seeds, or even grated cheese. Dip them in mustard, cheese, melted butter, or caramel. Homemade soft pretzels are delicious!